Thinking of planning a vacation on Nantucket? Close your eyes. Where do you see yourself? At a beautiful place where your every wish and need is met? You have come to the right place. 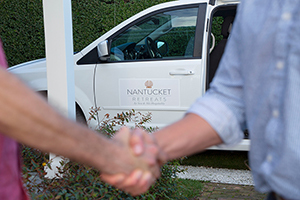 Nantucket Retreats is a guest centric organization that represents some of the finest properties in Nantucket. Whether you want an elegantly cozy cottage by the sea or a luxurious, sprawling estate with staff, we can find your dream vacation home. But finding it is only the beginning. Once you arrive, that is when the fun begins. We can arrange a chef for romantic dinners or a caterer for larger affairs; a hiking trip with picnic lunch or a custom-chartered deep sea fishing experience; a guest health club membership for your stay or a private yoga or Pilates instructor; an intimate massage in the privacy of your vacation paradise or a spa experience at a private spa minutes from your door. If you can dream it, we can do it. Nantucket Retreats, a division of Sea and Ski Hospitality, Inc., is a unique concept in worry-free vacation rentals. Our staff is here to make your dream a reality, whether it is coveted restaurant reservations, comfortable transportation, bike or car rentals, an extravagant catered dinner party, massages by the sea, or boat rentals. For the best vacation experience you can imagine, contact Nantucket Retreats and we will help you find the perfect location, the perfect home and the perfect list of services to create your perfect vacation. Our mission is to pamper our guests with casual luxury accommodations and exceptional guest services. When you make a reservation at Nantucket Retreats, you're reserving more than just a vacation rental. You're reserving a vacation experience. Once again Kenan and his team provided my family with a great vacation on Nantucket. Loved everything about the newly renovated unit. Our reservations office is open Monday - Friday; 9:00 AM - 5:00 PM. We are closed on all holidays. Sea & Ski Hospitality is committed to providing exceptional guest experiences and homeowner satisfaction. The Vacation Rental Managers Association and the Vacation Rental Housekeeping Professionals Association share our vision and we are proud to be a member company.